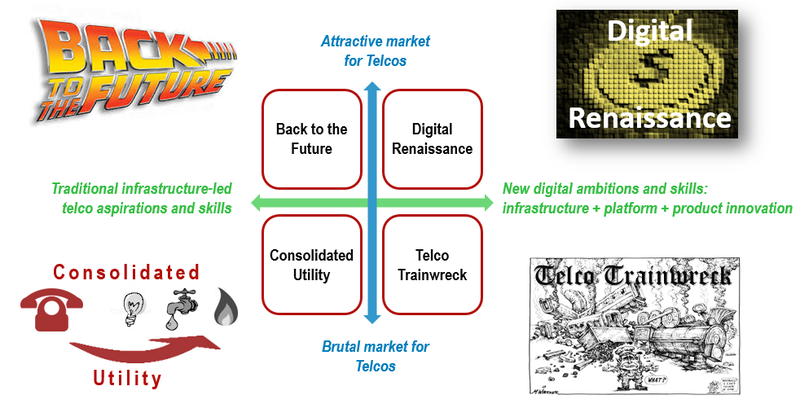 Seven predictions and four scenarios for how the industry might play out in Europe in the next 5 years: 'Digital Renaissance', 'Back to the Future', 'Commoditised Utility' and 'Telco Trainwreck'. Plus what are the take-outs for other markets? The second report in The European Telecoms market in 2020, this document uses the framework introduced in Report 1 to develop four discrete scenarios for the European telecoms market in 2020. Although this report can be read on its own, STL Partners suggests that more value will be derived from reading Report 1 first. Strategists (and investors) are finding it very difficult to understand the many and varied forces affecting the telecoms industry (Report 1), and predict the structure of, and returns from, the European telecoms market in 2020 (the focus of this Report 2). This, in turn, makes it challenging to determine how operators should seek to compete in the future (the focus of a STL Partners report in July, Four strategic pathways to Telco 2.0). Provide a ‘prediction’ for the future European telecoms market based on our own insights plus two ‘wisdom of crowds’ votes conducted at a recent STL Partners event for senior managers from European telcos (Report 2). Back to the Future. This scenario is likely to be the result of a structurally attractive telecoms market and one where operators focus on infrastructure-led ‘piping’ ambition and skills. Consolidated Utility. This might be the result of the same ‘piping’ ambition in a structurally unattractive market. Digital Renaissance. A utopian world resulting from new digital ambitions and skills developed by operators coupled with an attractive market. Telco Trainwreck. As the name suggests, a disaster stemming from lofty digital ambitions being pursued in the face of an unattractive telco market. The four scenarios are shown on the framework in Figure 1 and are discussed in detail below. Market Structure. The absolute and relative size and overall number of operators in national markets and across the wider EU region. Operator service pricing and profits. The price levels and profit performance of telecoms operators (and the overall industry) and the underlying direction (stable, moving up, moving down). The role of content in operators’ service portfolios. 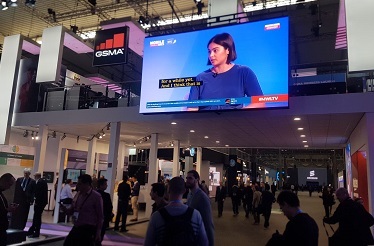 The importance of IPTV, games and applications within operators’ consumer offering and the importance of content, software and applications within operators’ enterprise portfolio. 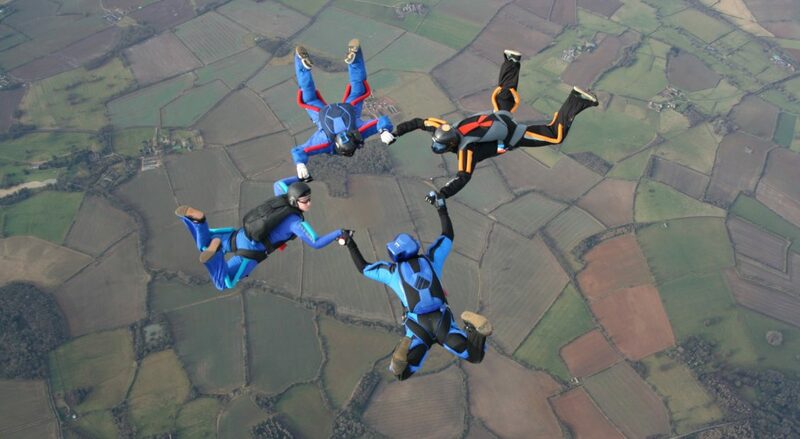 The degree to which operators can offer differentiated services. How able operators are to offer differentiated network services to end users and, most importantly, upstream service providers based on such things as network QoS, guaranteed maximum latency, speed, etc. The relationships between operators and NEP/IT players. Whether NEP and IT players continue to predominantly sell their services to and through operators (to other enterprises) or whether they become ‘Under the Floor’ competitors offering network services directly to enterprises. Where service innovation occurs – in the network/via the operator vs at the edge/via OTT players. The extent to which services continue to be created ‘at the edge’ – with little input from the network – or are ‘network-reliant’ or, even, integrated directly into the network. The former clearly suggests continued dominance by OTT players and the latter a swing towards operators and the telecoms industry. The attitude of the capital markets (and the availability of capital). The willingness of investors to have their capital reinvested for growth by telecoms operators as opposed to returned to them in the form of dividends. Prospects of sustained growth from operators will lead to the former whereas profit stasis or contraction will result in higher yields. Key industry statistics. Comparison between 2020 and 2015 for revenue and employees – tangible numbers that demonstrate how the industry has changed. The health and structure of all industries in Europe is dependent, to a large degree, on the European macro-economy. Grexit or Brexit, for example, would have a material impact on growth throughout Europe over the next five years. Our assumption in these scenarios is that Europe experiences a stable period of low-growth and that the economic positions of the stretched Southern European markets, particularly Italy and Spain, improves steadily. If the European economic position deteriorates then opportunities for telecoms growth of any sort is likely to disappear.